‘The Natural Health Bible for Women’ Is a beautifully, colour illustrated practical, easy-to-use, one-stop reference book for women of all ages. Containing everything you need to know to make informed choices about your body, how it works, and how to keep it in the best of health. Within each chapter Dr Marilyn Glenville focuses on ailments and conditions. She explains what they are, why they happen, and how to tackle them using conventional medicine and complementary treatments, including herbal remedies, aromatherapy, homeopathy, massage, and nutrition. Throughout Marilyn Glenville emphasizes the importance of using the right approach for you of natural or conventional medicine – or a combination of both. 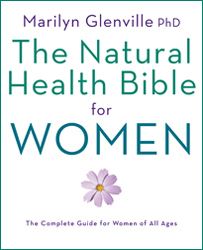 ‘The Natural Health Bible for Women’ Is a practical, easy-to-use, one-stop reference book for women of all ages. Containing everything you need to know to make informed choices about your body, how it works, and how to keep it in the best of health. Chapter One: Introducing Your Body gives a detailed analysis of how your body works, and what makes it so miraculously unique. It then covers essential information on the role nutrition and complementary therapies can play in your well-being. Chapters Two, Three and Four look at Your General Body Systems such as breast problems, PCOS, ovarian cysts, PMS, period problems, endometriosis, cervical problems, vaginal infections, thyroid and adrenal problems and hormonal balance ; Conception, Pregnancy and Birth; and Through The Menopause. Chapter Five: Optimum Healthcare looks at what you can do to maximise your general health throughout your life. ‘The Natural Health Bible for Women’ provides all the answers to the questions you ask about your body – why things happen to you, what you can do to fix them, and how you can ensure optimum health and well-being all through your life. “So, if you would like to find out how you can ensure optimum health and well-being all through your life you should send for this book now.